The SpeechExec ProTranscribe Set LFH7277 is a digital transcription system specifically designed to make transcription easy and intuitive. The ergonomic accessories and innovative transcription software let you easily and efficiently manage jobs by displaying all relevant information such as jobs marked as priority and each job transcription status. 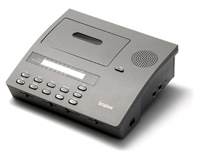 SpeechExec Transcription Set LFH7277 is the sophisticated solution that simply lets you get on with your job.